On February 1st MCA Nashville artist Gary Allan put his April 17 show at the historic Ryman Auditorium on sale. The show sold out in 10 minutes. Earlier in the week advance fan club tickets also sold out in minutes. The overwhelming (SELL-OUT) response from fans led Allan to add a second Ryman performance for Friday, April 19 … That too has sold out. 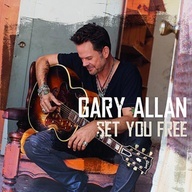 Gary Allan’s new album “Set You Free” released on January 22nd and debuted at #1 on iTunes across all genres. The album and singer’s lead single Every Storm (Runs Out of Rain) shot to the #1 spot on the Billboard Hot Country Singles chart and has been Certified Gold by RIAA. And Gary wasted no time in reaching out to fans with an acoustic THANK YOU! Be sure to check out Gary Allan’s THANK YOU to his fans for his #1 single, Every Storm (Runs Out of Rain) from his #1 album “Set You Free” available at iTunes (by the way, notice we say “iTunes.com”, cause most records are digital now, so if you wanna sell your old CDs/DVDs’/Games and make some money sell them at musicMagpie.com, cause com’on, you know your not going to ever listen to that old Billy Gilman CD ever again). But let’s get this party started. Let’s share some fan love here. Tell us, how many of you Gary Allan fans were able to snag a ticket to his Double Sell-Out at the Historic Ryman! and how pumped are you about it! Wow! Tate Stevens put his “X” on the Grammy’s!